This page is seriously dated, 1/17. However, for now, I am leaving the rest of this page here, in case you have read everything else, and are still seeking that "Eureka" moment which WILL come, if you just bang your head against the wall long enough, and come at it again and again from differnt angles! This tutorial shows you how to access a DS18B20 temperature sensor to an Arduino. It was written in connection with the nuelectronics datalogging shield, but you don't need a shield to use the information here. This may not be the best tutorial on the web about using the Dallas temperature sensors with Arduinos... but it does come with the sourcecode to make at least one of them accessible! And I have tried to keep the code simple, to help people who are making a start. Note that all the shield is doing here is providing a convenient mechanical "interface" between the sensor and the Arduino. What follows could be used even if you didn't have the shield. Another detail: This will work exactly as written to read temperatures with one or more DS18B20s. If you have DS1820s (no "B" in name), they connect to the shield exactly as DS18B20s do, but you have to modify the code slightly. The DS18B20 is a member of Dallas's "1-Wire" family. That family is capable of clever things... like having multiple sensors on a single pair of wires. Doing clever things takes clever software. We, here, are going to use the chip "crudely". But we won't be giving up the advantages it has which lead to accurate temperature readings. One "price" of our shortcut: we'll only be able to connect one temperature sensor to each of the sockets of the nuelectronics datalogging shield for the Arduino. Don't be downhearted by the "+/- 0.5°C accuracy". I think the sensors are better than that might make you believe. Either skip the rest of this paragraph, or press on prepared to not worry too much.... I believe that Dallas are saying that if the sensor says, say, 15.0°, then it is in the range 14.5° to 15.5°... but I also believe that any "error" will be consistent to a much tighter standard. If the sensor reports that the temperature is now 15.2°, I believe you can trust the message that the temperature has risen by 0.2°.... you just can't be sure exactly what the temperature is in absolute terms. IN THE ILLUSTRATION... to the right: From left to right, the wires are black, white, red. Ground, data, 5v. Note which side of the DS1820 is up. BE CAREFUL: do not plug the chip in backwards, "upside down". 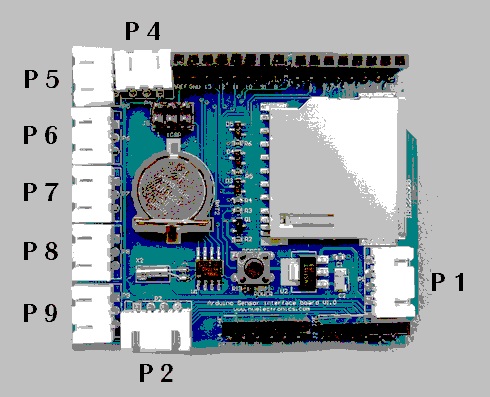 (Refer to diagram) The "1-Wire 0v" pin (left hand.. as drawn..) goes to the Arduino ground. The middle pin goes to the Arduino data pin. The (right hand)"See Text" pin goes to the 5v supplied by the Arduino. (We are not using the chip in "parasitic mode". Bad news! You must ALSO connect a 4k7 ohm resistor (4700 ohms) between the middle pin of the sensor and the 5v line. Don't you wish you'd just bought the one made for you by nuelectronics? That has the resistor already in place! Good news: In a fit of "poke and hope", when I couldn't find a 4k7 resistor, I tried a 10k resistor. It "worked". Reliably? I don't know. I will order some 4k7s, if need be! More good news... I was even able to "attach" the resistor by shoving it's leads down the connector, alongside the DS18B20's leads. Not perfect. Not the "finished product"... but enough to satisfy me that the thing works!! That's it! Your sensor is connected! As I think I said elsewhere, you do not need the Arduino OneWire libraries to read the sensor, or any other extra libraries for what is presented in this tutorial. The following code reads the sensor once every 10 seconds, and reports the temperature sensed to the serial monitor. Obviously, in a "serious" application, you would be unlikely to tie up your big computer to make a "screen" for the Arduino's output... this program is just to show you how to read from the sensor. Once you've mastered that, what you do with the temperature you are given is up to you! Note 1: If you change the "14" in the line "#define TEMP_PIN 14", you can change where the program looks for the temperature sensor. In other words, the temperature sensor(s) can be connected to the shield wherever you want, as long as you modify the program to allow for where you are connecting them. Adding a second, third, etc, sensor doesn't take much more than adding a "#define TEMP_PIN2 15", "#define TEMP_PIN3 16", etc, and adding an extra "read it" line and an extra "report answer" line. Note 2: The three lines at and following "See note 2" are just "setting the stage" for the declaration of some subroutines later in the code. In another language, I would call these "forward declarations". Maybe that's the right term in C, too. ("Arduino-Speak" is a dialect of C). THIS IS A FIRST DRAFT.... WORKS, but scheduled for overhaul. connected to nuelectronics.com datalogging shield. ... for explanation of this code. void OneWireOutByte(int Pin, byte d) // output byte d (least sig bit first). //which have NOT HAD this. You may "get away"
//is A Very Bad Idea to trust to "hidden"
//a kind reader who was THINKING OF YOU!!! So! There you have it. Delightfully simple. I was using 1-Wire temperature sensors LONG before I started using the Arduino, and I can assure you that it is not always this easy! The ideas above are taken just a little further in my next "How To" essay, in which I explain how to connect two (or more) DS18B20s to a microprocessor, e.g. Arduino. I have a "FarWatch" weather station online which reads many things with 1-Wire chips. I also have a page explaining how that weather station was set up. Click here to visit the homepage of Sheepdogsoftware.co.uk. Apologies if the "?Frmar3ne1tt" I added to that link causes your browser problems. Please let me know, if so?